When Your Patients Drive on Meds, What is Your Liability Risk? You have prescribed pain or sleep medication for a patient, and he has a car accident while taking the medication, injuring or killing another driver. Can you be sued — not just by the patient, but also by the family of the other accident victim? If you didn't properly inform your patient of the risks of driving while taking the medication, the answer may be yes. Last December, the Massachusetts Supreme Judicial Court ruled that internist Roland J. Florio, MD, could be sued for damages by the family of a ten-year-old boy who was struck and killed by a patient of Dr. Florio's when the patient lost consciousness while driving. The patient, David Sacca, 75, was taking several drugs, including painkillers, antidepressants, blood pressure medications, and steroids; the possible adverse effects included drowsiness, dizziness, and fainting. By a 4–2 decision, the court concluded that Dr. Florio owed a “duty of care” to Kevin Coombes. Before the crash, Sacca reported no side effects to Dr. Florio and had no problems driving, according to the court opinion. At one point in 2000, Dr. Florio warned Sacca that he should not drive while he was being treated for cancer. When treatment ended in 2001, Dr. Florio told Sacca he could drive again. The majority opinion likened doctors who prescribe medication without warning of side effects to bartenders who knowingly serve drunk customers. The court was hardly unanimous in its decision. Two dissenting judges warned that the ruling could interfere with the doctor-patient relationship. It “…significantly shrinks the essential and protected space within which doctor and patient can freely move together,” wrote Chief Justice Margaret H. Marshall. “Gone would be the physician's ability to exercise independent professional judgment. The physician would be forever looking over his shoulder.” They predicted a flood of litigation and defensive medicine, as well as violations of doctor-patient confidentiality because of third-party lawsuits. And even in the four-judge majority, one of the four wrote a separate concurring opinion arguing that the majority went too far in putting forth a broad rule that a physician owes a reasonable duty of care to anyone foreseeably put at risk by the failure to warn a patient of side effects. “To equate a physician's prescribing of medication to ‘unreasonably dangerous’ conduct, similar to serving alcohol to minors…or to the reckless storage of firearms… is an immoderate and indefensible characterization of the medical profession, and one that…impermissibly intrudes on the traditional physician-patient relationship held virtually inviolate since the time of Hippocrates,” wrote Justice John M. Greaney. Divided or not, the ruling set the stage for this particular case to go forward — and potentially opened up the floodgates for greater liability for other physicians, some doctors warn. Some other courts have allowed liability in cases in which the patient was treated in the office and then immediately released to drive, but the two-month gap between Sacca's last patient visit and the accident is a much wider window. “In a sense it's diffusing responsibility by making physicians accountable not only to our patients but to everyone they come in contact with,” B. Dale Magee, MD, president of the Massachusetts Medical Society, told the Lowell Sun at the time of the ruling. “To allow (a victim) to pursue a doctor directly for something a patient does is troublesome.” He pointed to concerns that malpractice insurance may not cover this type of lawsuit, as well as the question of what constitutes an adequate warning. Bacon D, Fisher RS, Spanaki MV, et al. American Academy of Neurology position statement on physician reporting of medical conditions that may affect driving competence. Neurology 2007; 68:1174–1177. 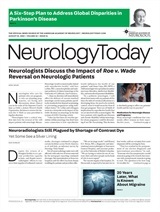 Neurology Today8(8):24, April 17, 2008.